Baby girl shower themes can be a lot of fun if you know the mom-to-be is happy to share the news that she is expecting a girl. Hosting a princess baby shower will help make the mom-to-be feel like royalty while celebrating the arrival of her little princess. First, cut strips of tulle. The strips should be double the height of the hat box. Wrap the elastic band around the top of the box. Loop the tulle strips around the elastic, working your way around the box with alternating colors of pink and white. That’s it! As for your candy jars, instead of tulle strips, cut various-sized circles of tulle. Once you pop the lid on top of the tulle, the material will be securely in place and will hang under the lid in the shape of a tutu. 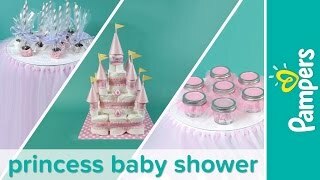 Princess Diaper Cake: A princess castle diaper cake is easy to assemble, and it's a practical, yet fun gift for the mom-to-be, who can never have enough diapers! Yours can serve as a chic centerpiece at the party, and the mom-to-be will be grateful for the extra diapers once she brings her little one home. Learn how to make a princess diaper cake with our easy, step-by-step tutorial here. Chocolate Brownie Cake Pops: What could be more regal than these sparkly magic wands? Lightly grease your hands with vegetable oil to keep them from sticking, and roll each brownie square into a ball. Insert a cake pop stick into each ball. Melt chocolate chips in a mug until smooth, then dip each pop into the chocolate before letting them dry on a sheet of parchment or wax paper. Repeat with white chocolate, then roll each pop in something pink, like edible sprinkles. For individual party favors, wrap each pop in cellophane, and tie with a bow. Your guests will love these pink and gold baby shower snacks. To tie in with the theme, serve pink-colored punch or cotton candy. For a princess-themed baby shower, consult with the mom-to-be about whether she’d like some games that inspire your guests’ creativity. You can provide a white baby T-shirt or bodysuit for each guest (along with decoration supplies), and ask each guest to design the front of the outfit for the new baby. Or, invite everyone to design a fabric square to be made into a keepsake quilt for the baby. With either of these ideas, your guests will have an opportunity to provide a handmade memento for the family. For more baby shower themes for girls, check out our baby shower theme tool. In addition to more girl baby shower themes, you’ll find lots more ideas for baby shower decorations, food, and party games. And, if you know the mom-to-be still needs help finding a name fit for her little princess, let her know about the Baby Name Generator, which can help her find the perfect royalty-inspired name.